By offering a convenient and reliable way of monitoring the voltage of individual cells during storage battery discharge testing, the new BVM battery monitor from Megger allows failing cells to be readily located. This means that battery performance and reliability can be restored by simply replacing the defective cells, rather than the much more costly option of replacing the whole battery. Designed for testing large storage batteries of the type used in electricity substations, telecommunications facilities and data centre UPS installations, the BVM uses a modular design, with one BVM module required for each cell in the battery bank. Each BVM module connects to the next with a single-cable daisy-chain connection, and up to 120 modules can be used simultaneously when testing a battery bank. The BVM system is, therefore suitable for use with a wide range of battery banks, particularly those used in substations and similar applications. All BVM modules are identical and may be used anywhere in the string. 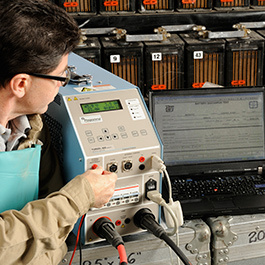 When used in conjunction with Megger's TORKEL battery load tester and either TORKEL Win or PowerDB software, BVM battery voltage monitors allow completely automated battery bank capacity tests to be performed in line with the IEC test method. The tests log individual data for every cell, and complies fully with NERC (North American Electrical Reliability Corporation) and FERC (US Federal Energy Regulatory Commission) requirements. BVM modules are supplied fitted with a convenient croc-clip connector, but this can easily be exchanged with any standard banana-plug clamp or extension cable, thus providing maximum flexibility for use with batteries of almost any type. A timesaving auto-discovery feature is also provided which enables the host device to automatically determine the number of cells in the battery under test, and to identify them sequentially. Two user-selectable voltage ranges are offered by the BVM modules: 0 to 5 V DC and 0 to 20 V DC. Resolution is 1.00 mV on both ranges with an inaccuracy of < 0.1% of full scale ± 0.002 V. The maximum battery string voltage supported by the BVM system is 300 V DC.